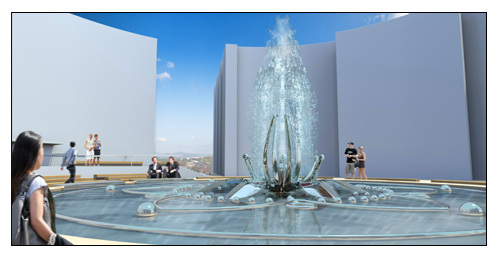 Within the Haifa District in Israel, 2016 fountain design for a new atrium in Kiryat Motzkin. The investor's request was to create a fountain with the possibility of musical-light concerts with choreography of water shapes. The entire fountain, including concerts, is solved by computer technology. Pool diameter 20m, stone material and stainless steel.